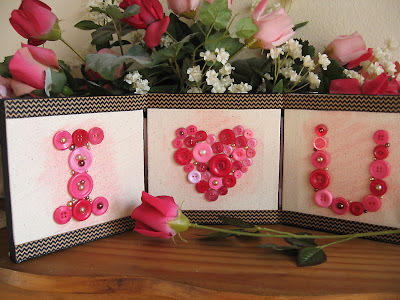 Today I have a quick, easy and fun idea for a tabletop decor piece for Valentines. Three 6 x 6 burlap canvases from Eclectic Paperie adorned with nothing more than buttons, ribbon and a little sparkle. This is a great project if you have LOTS of buttons you'd like to use up. I had quite a few pink buttons, so I started with those and then filled in some spaces with various colors of adhesive pearls. The canvases are nice and small at 6 x 6 inches. Perfect for my foyer table, which I decorate each season. 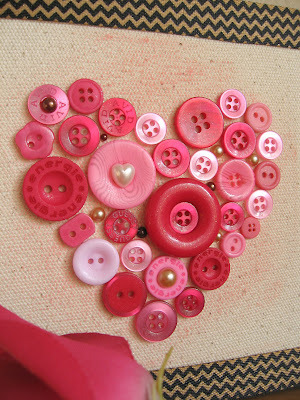 Here's a tip: lay out your buttons into the shape you like on a piece of card stock cut the same size as your canvas. Take a photo for reference. Then you can begin to adhere to the canvas. I used Alene's Super Thick Tacky Glue. The photo will help you as you assemble. To hinge the three canvases together, I simply adhered a long strip of chevron grosgrain ribbon along the tops and the bottoms of all three, allowing just a little space in between for some movement. I finished off the project by giving it a few spritzes of Perfect Pearls spray for some shimmer. What a lovely home decoration and so perfect for Valentine's Day! Very clever idea!